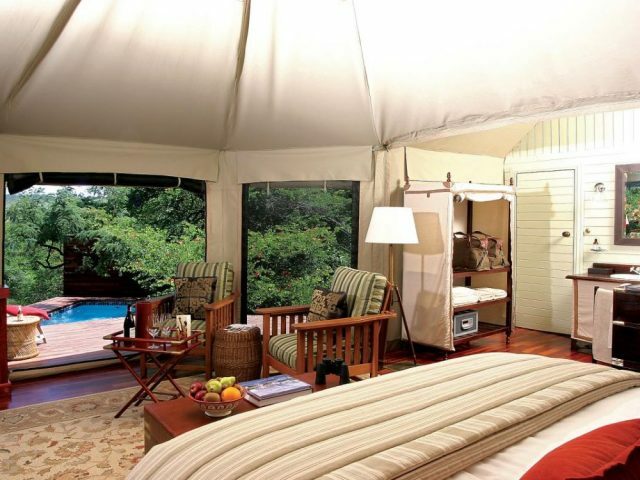 The tented camp offers an authentic bush experience in accommodation reminiscent of a bygone era - the romantic canvas tents are a favourite for their charming colonial feel! Good chances of seeing at least 4 of the Big 5 (that pesky leopard can be elusive as always) – not to mention other wildlife such as cheetah as well as an abundance of bird life! There’s little to beat the romance of having a bath under canvas all lit by flickering lamplight – definitely measures sky-high on the romance meter! 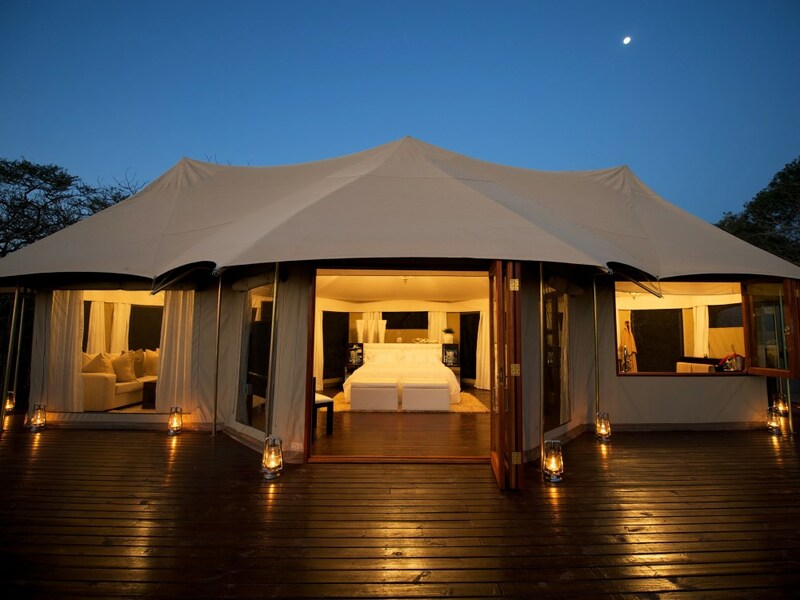 Whilst we’re certainly always up for experiencing top-end luxury lodges, there’s something about an authentic tented camp that really gets us excited – it just seems that you often have an even closer connection to your bushy surroundings when you’re sleeping under canvas! The good news is that Thanda Private Game Reserve, situated just north of Hluhluwe in northern Zululand, is able to offer the best of both these worlds – for unabashed lovers of luxury there’s the Safari Lodge with its 9 stunning and wonderfully luxurious villas; then for those more “back to basics” bush lovers there are the 15 lovely tented rooms and lantern-lit atmosphere of the Thanda Tented Camp! 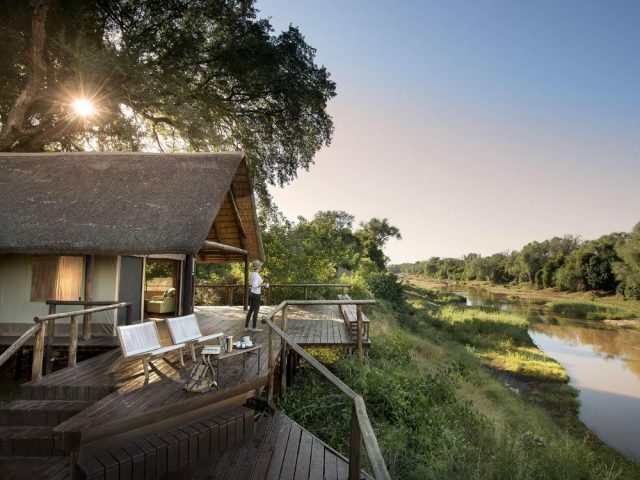 Having said that, perhaps the term “back to basics” is not exactly accurate when describing Thanda Tented Camp - whilst it may be a lot simpler and less luxurious then Thanda Safari Lodge, but when compared to other tented camps it is definitely one of the nicest that you’ll ever see! The lodge is located on a 14 000 hectare Big Five private game reserve just north of Hluhluwe in Zululand, an easy drive from Durban. It offers an authentic bush experience in a way that evokes the wonderfully nostalgic ambiance of the bygone years of colonial safari, yet it is nowhere near as rustic and basic as many other tented camps that we have seen. The reserve was originally purchased as a degraded cattle farm and the owners then embarked on an extensive rehabilitation project which included a large-scale re-stocking of animals including reintroducing the Big Five. So what of the camp itself? It consists of 14 tented rooms as well as a gorgeous honeymoon tent – the tents are spacious and quite luxurious and we especially like the way that the ceiling of the tent is draped in soft white muslin that adds a really romantic feel! The en-suite canvas bathrooms boast gorgeous standalone bathtubs, his ‘n’ hers wash basins and copper fixtures which add to that whole “Out of Africa” feel. Another favourite feature of the tents is the wooden deck where you can relax in a comfy chair with a book or pair of binoculars and while away the hours between game drives. The tented rooms are essentially non-electrified, so you get that wonderfully romantic atmosphere that always seems to result from using paraffin lanterns or candles! 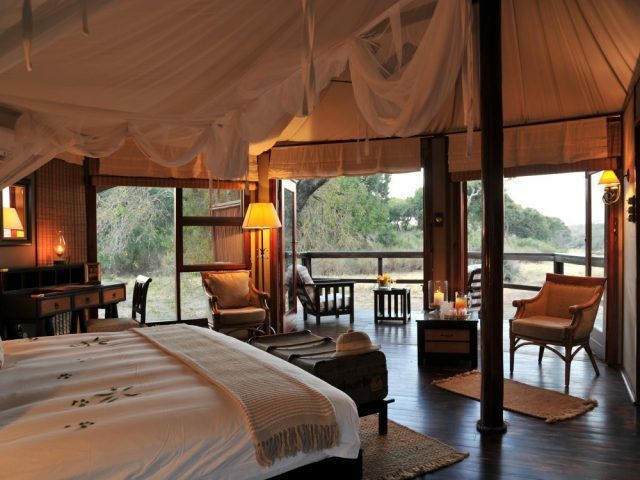 For an even more romantic option, Thanda Tented Camp also offers one honeymoon tent which adds a comfortable separate lounge area for relaxation to the spacious bedroom complete with king-sized bed. We also love the outdoor shower and the private plunge pool which has spectacular panoramic views of the reserve – in fact to call this honeymoon suite a “tent” is underselling it as it really is very comfortable and luxurious and you almost forget that you're only surrounded by canvas! 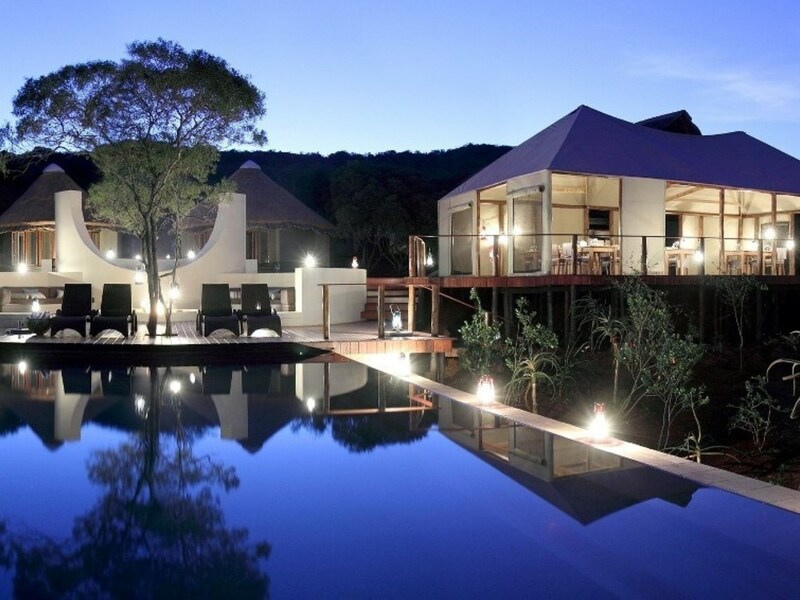 The main public area of the Tented Camp is similarly a good couple of notches higher up the quality scale than the average tented camp – it also has a more modern or contemporary feel courtesy of the infinity swimming pool and (our favourite part!) the gorgeous outdoor baraza-style lounge area with built in seating around a stunning fire-pit! It’s the perfect place to relax with a glass of wine around a crackling log fire under the stars! Just off to the side of the fire-pit there’s also a more conventional lounge area under thatch with canvas walls which open up so that you can still enjoy the gorgeous views whilst you’re relaxing at the bar or chilling with a good book and a cappuccino on one of the comfy sofas. Then there’s a dining area under canvas roof where you can enjoy the delicious food on offer! Your day starts with a personal wake up knock (one of the staff knocks on your tent door - no loud beeps from an alarm clock here!) when you’ll have to drag yourself from your cosy and luxurious bed, roll back the canvas door and let the dawn chorus of the surrounding bush be heard in its full glory. You’ll go in search of the elusive Big Five in open 4x4 vehicles under the supervision of knowledgeable rangers and trackers – other animals to look out for are the endangered black rhino, cheetah, hyaena, warthog and loads of plains game as well as an abundance of bird life! On your return from your game drive and a hearty breakfast, you may choose to relax around the pool deck or perhaps enjoy a pampering massage in your tent or the new Spa tent. At the end of your day you’ll be escorted back to your tent, the trail lit by paraffin lanterns, to find your tent already romantically lit by flickering lamplight! Children age 8 to 16 years pay 50% when sharing with 2 full paying adults. Children age 8 - 16 years sleep on individual single beds.